A decade ago today, the MySQL database was 12 years, 10 months and 4 days old. PostgreSQL, for its part, clocked in at 11 years, 8 months and 19 days old. Though not quite teenagers, both databases had a laundry list of accomplishments to point to: robust communities, massive distribution and even high profile success stories with various web players. At the 2005 Open Source Business Conference, even the self-selected audience of senior technology executives willing to attend an open source conference – which included representatives of Citistreet, Fidelity, JP Morgan Chase, Priceline and others – expressed their reservations about trusting open source for “mission critical” database workloads. The following three years didn’t, on the surface, appear to make much of an impact on enterprise attitudes towards open source. Within mainstream enterprises ten years ago, open source databases were generally regarded as a non-factor. 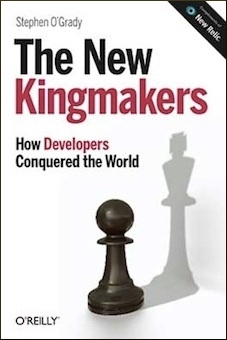 With analysts characterizing their adoption as “superficial” and “limited to certain specific application workloads,” enterprises displayed little interest in the likes of MySQL and PostgreSQL, though admittedly the story below the senior executives’ radar looked very different. Open source databases might be good enough for Facebook or Google, but they weren’t enough to displace Oracle and other commercial suppliers for more conservative enterprise buyers. Or at least, it didn’t appear that way. What’s interesting is that Oracle’s financials were showing signs of an eroding ability to sell new licenses of its software by this point. Even as Oracle’s software revenue grew, the percentage of that revenue that came via the sale of new licenses was shrinking. In the year 2000, when MySQL was five and PostgreSQL four, about 71 cents of every dollar that Oracle earned was via the sale of a new on premise software license. By 2008, that number was down to 42 cents. 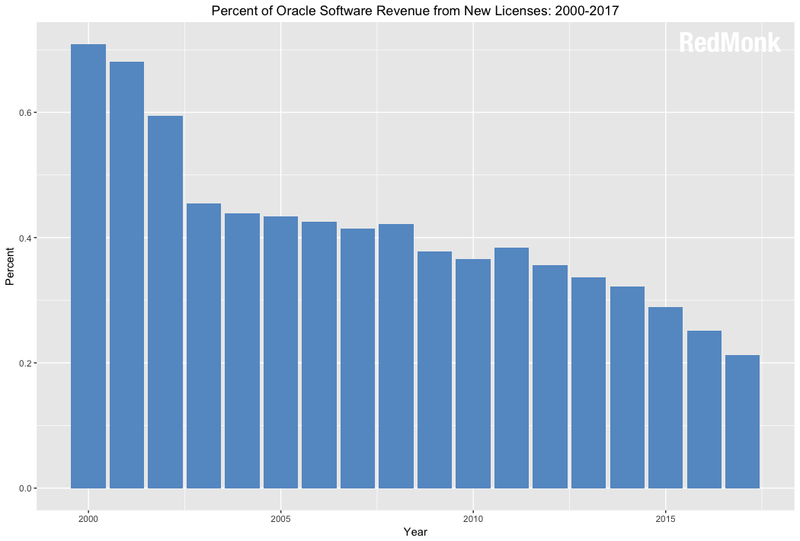 As of last year, the amount of every dollar of software revenue that comes from the sale of a new license of software at Oracle was around 21 cents. The takeaway here, however, isn’t that decline, and more particularly not to imply that there’s a facile explanation for it such as competition from open source alternatives. The causative factors are many and complex, and both they and their implications have been discussed at length elsewhere. What’s of greater interest today is the acceptance rate. Even after a decade of performance, relatively high profile success stories and near ubiquity amongst developer populations for open source databases, traditional IT suppliers would still not publicly acknowledge any significant usage. If anything, they went out of their way to signal their reluctance to consider alternatives to standard commercial offerings. One interesting question to consider is whether cloud based databases have faced and/or will to continue to face the same uphill battle with respect to adoption. In theory, they should. Much of the reticence to adopt open source databases, for example, centered around risk. Where open source was embraced in other areas of the enterprise from operating systems such as Linux to web front ends such as the Apache HTTP server, the explanation for the relative lack of database adoption was that the database was a bridge too far. Specifically, the risks associated with the viability of the open source databases and the migration to same were too high to justify substantial adoption. Curiously, however, enterprises have shown few if any of the same concerns with regard to adoption of cloud based databases. Amazon Web Services first released its Relational Database Service in October of 2009 with a MySQL flavor; a PostgreSQL implementation followed in November of 2013. In March of 2017, a little less than four years later, a senior technical leader for a large financial services institution stood on stage at Postgresconf in Jersey City and detailed his organization’s complete migration to RDS Postgres – so complete that the traditional DBA role was deprecated. Eight months later, another major financial organization would repeat this exact same message in an analyst-only session at AWS re:Invent. Nor are these isolated use cases; as quickly as AWS broadly has grown, its Aurora database service is the fastest growing in the provider’s history. Elsewhere, investments both organic (MongoDB/Atlas, Google/Spanner, Oracle Cloud Database, etc) and inorganic (IBM/Cloudant&Compose, Elastic/Found, Rackspace/ObjectRocket, etc) have supported the hypothesis that databases offered as a service had a bright future, and might even be the future at least as far as growth was concerned. The argument has been made here previously that innovation is coming at an accelerating rate in this industry. What the contrast between the adoption rates of open source databases and cloud-based databases suggests, however, is that even amongst conservative buyers the rate of acceptance of this innovation, this change, if not quite keeping pace with the innovation, is accelerating along with it. The bad news for vendors has been that new competition is arriving more quickly than it ever has previously. The good news is that they might not have to spend years convincing even the most conservative enterprises that it’s usable. It took well over a decade for enterprises to accept open source databases; it took less than half of that for their cloud equivalents. The slow ones now will later be fast, indeed. Disclosure: Amazon, Elastic, Google, IBM, MongoDB and Oracle are RedMonk customers. Rackspace is not presently a customer.